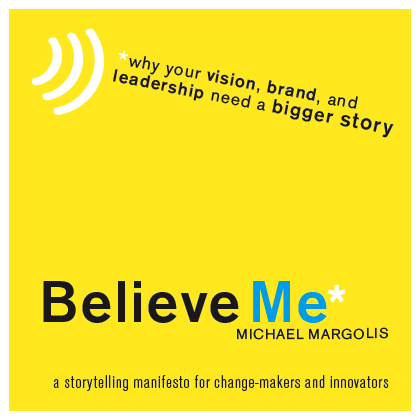 I shared this FREE book Believe Me Story Manifesto for Change-Makers and Innovators by Michael Margolis on how to build your brand's story with the students in my Corporate Communications class. I think it clearly explains through the voice of many very successful individuals including Barack Obama; how being a master storyteller can lead to immeasurable success for your brand and for you. The author writes:" If you are trying to influence, persuade or convince others to believe your message, you need to read this book." Michael Margolis. The best way I can describe what is meant by brand story is that is a "truth" that is created and later becomes true, because it is accepted and believed by the masses (or your target audience). In other words, when the public agrees with the brand story, it is considered true until someone or something disproves it. Consider this quote by Seth Godin author: Tribes: We need You to Lead Us: " Great Stories agree with our world view. The best stories don't teach people anything new. Instead, the best stories agree with what the audience already believes and makes the members of the audience feel smart and secure when reminded how right they were in the first place." Hello fans of “Big Bang Theory.” The truth is that Sheldon gay?